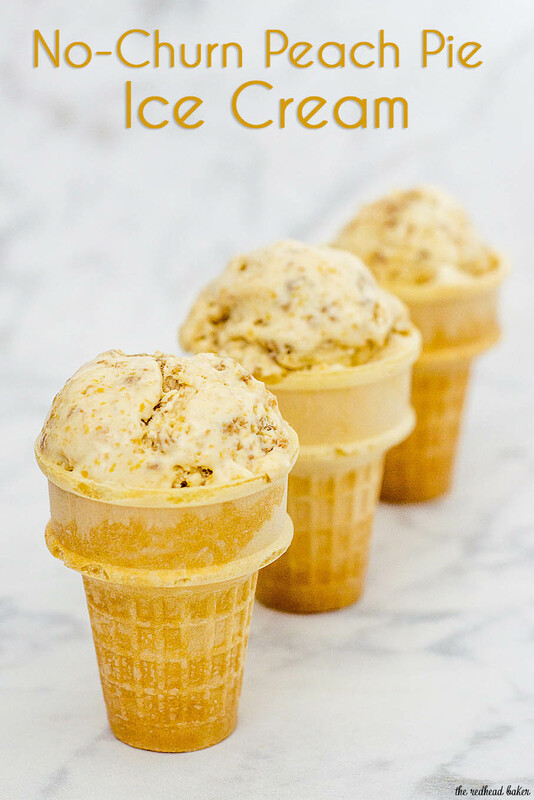 This peach pie ice cream is flavored with roasted peaches and has a swirl of graham cracker crumb crust, and no ice cream maker is required to make it! Today’s #SundaySupper event, hosted by Sue of A Palatable Pastime, is all about peaches. Peaches are one of my favorite summer fruits, so I was having a hard time deciding what recipe to share. I think I changed my mind at least four times. Peaches are so versatile. They’re fantastic in savory dishes and condiments, and in sweet dishes, too. I was thinking about a classic peach cobbler, but it’s been SO hot and humid here in Philly, I didn’t want a warm dish. 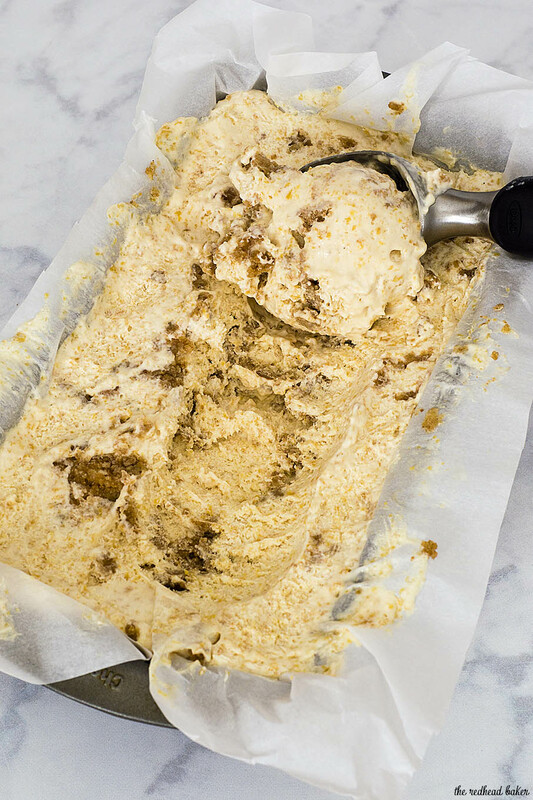 I was browsing Pinterest for inspiration, and came across peach pie ice cream: roasted peaches and sweetened graham cracker crust swirled through vanilla ice cream. It sounded so refreshing, but, I wanted peach-flavored ice cream, not peaches IN ice cream. I also didn’t want to go through the three-day-process it takes me to make ice cream. My ice cream maker bowl needs to chill for 48 hours (most are ready to go after 24 hours), then make the base, chill it, churn it, and freeze it overnight. I didn’t have time for all of that. I decided to give no-churn ice cream a try for the first time. 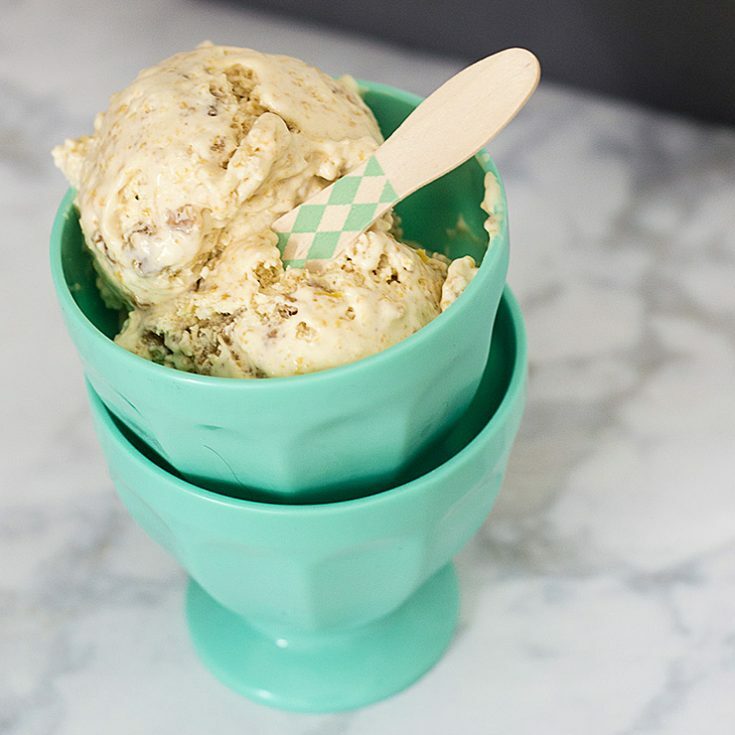 There are different methods to no-churn ice cream, some use condensed sweetened milk, some use eggs. This one uses sweetened condensed milk, and then whipped cream is folded in to lighten the custard. There are several steps to preparing this ice cream, but I assure you, it’s all worth it. Keep a close eye on your peaches, if you roast them until they dry out, they will not be easy to puree. You want them to have bubbly juices around the edges, just like a pie would have. As you prepare your loaf pan for the custard, you’ll probably think there’s no WAY all that ice cream will fit! It will, just pack it down. Then, hard as it will be, do not touch it for 8 hours AT LEAST. The longer, the better. The sheet of plastic wrap over the top will help prevent crystals from forming. Once it hardens, scoop away! Serve in cups, ice cream cones, waffle bowls, whatever you like! One note — if you’re craving this recipe outside of fresh peach season, you can also use frozen peach slices NOT packed in syrup. Thaw them, then continue with the recipe. 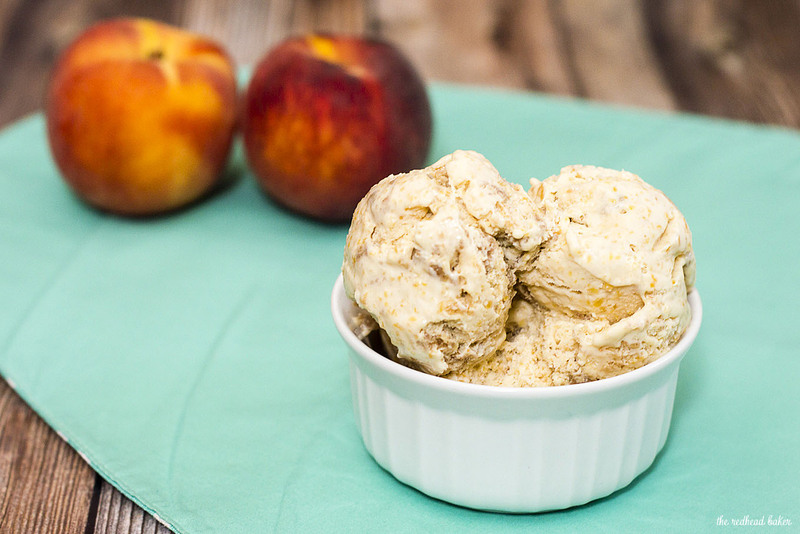 Pin this recipe for No-Churn Peach Pie Ice Cream for later! Chill the mixing bowl ahead of time to make whipping the cream easier. Preheat the oven to 400 degrees F. Line a baking sheet with parchment paper. Spread the peach slices out in a single layer and sprinkle with the brown sugar and salt. Roast until golden, flipping once or twice during roast time, about 30 to 35 minutes. Transfer to a food processor, add the bourbon and puree. Set aside to cool. Turn off the oven. Stir together the graham crumbs and melted butter. Using your hands, squeeze portions of the mixture together to form clumps. 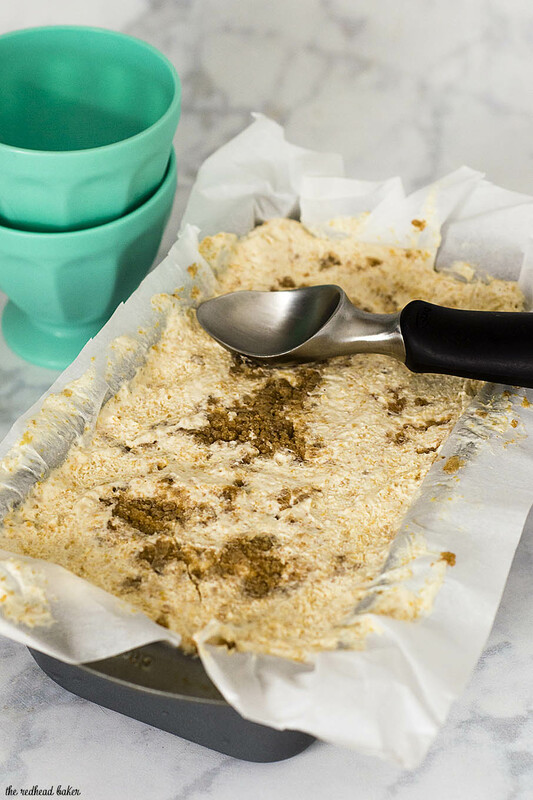 Spread the mixture out on a parchment-lined baking sheet and place in the warm (but still turned off!) oven until the butter dries. In a large mixing bowl, whisk together the pureed peaches, sweetened condensed milk, almond and vanilla extracts until combined. Place the cold cream in the chilled bowl of a stand mixer and beat on medium high speed until stiff peaks form. Fold the whipped cream into the peach mixture until evenly combined and no white streaks remain. Add the graham cracker crumbs to the mixture and gently stir to distribute. Pour the mixture into a parchment-lined loaf pan or a freezer container. Freeze for at least 8 hours. Discover more #SundaySupper recipes featuring peaches! Mmmmm….I want a double scoop on TOP of my peach pie! What a glorious ice cream! 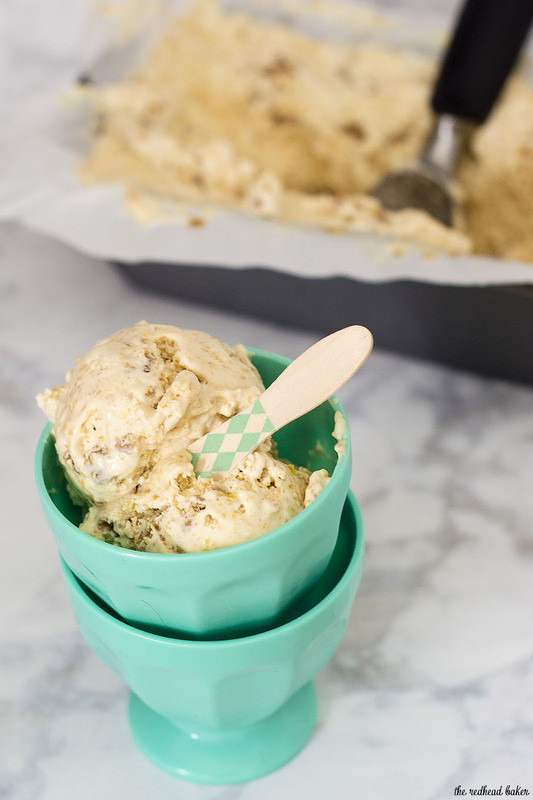 I lvoe no churn ice cream recipes and I’ve been putting graham cracker swirls in mine too! No churn, I’m there! Love the graham in here! Since we don t own an ice cream maker, it s really the way to go In fact, I don t even feel the need to ever own one because this method really does make amazing ice cream.